The object of her affection? something no one had ever said before. Maybe, maybe. . . maybe. and she wondered . .
to dissect the human heart? Kathi Appelt was born in North Carolina but grew up in Texas. A National Book Award finalist and Newbery honoree, Kathi is the author of more than thirty books for children and young adults. She has two grown children and lives in Teas with her husband. 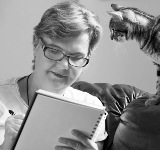 Learn more about Kathi at www.KathiAppelt.com. This is so sweet and so true! As a teacher, I can attest to those poor girls whose unrequited crushes flatten them like a pick up truck--all four tires. I had a crush on my 6th grade teacher, and it felt just like this! I really like this poem. I love this poem, and the collection, Poems from Homeroom, all of the poems are just as wonderful as this one.